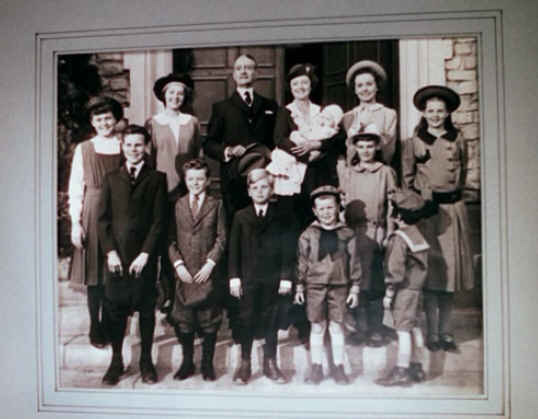 The classic 1950 movie Cheaper by the Dozen was based on a book that told the true story about Frank and Lillian Gilbreth and their 12 children. 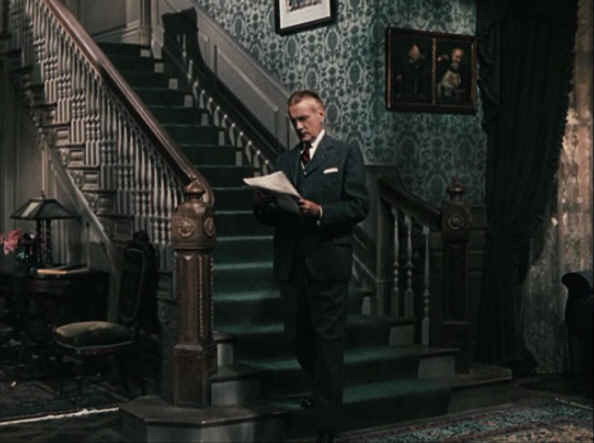 When the movie opens, Frank (Clifton Webb) announces that he is moving his family from Rhode Island to New Jersey. The kids protest at first, but when they see this beautiful Second Empire Victorian, they change their tune (wouldn’t you?). The movie was filmed on a backlot known as St. Louis Avenue. Above is a photo someone snapped of the house in the 1970s, before it was razed. You can see more photos of how it looked on the backlot in the ’70s here. Frank Gilbreth was a famous efficiency expert who thought he could run his family with the precision of a factory. He had all sorts of time-saving routines for them that I wanted my own family to try after reading the book when I was a girl, but they weren’t as enthusiastic…ha. 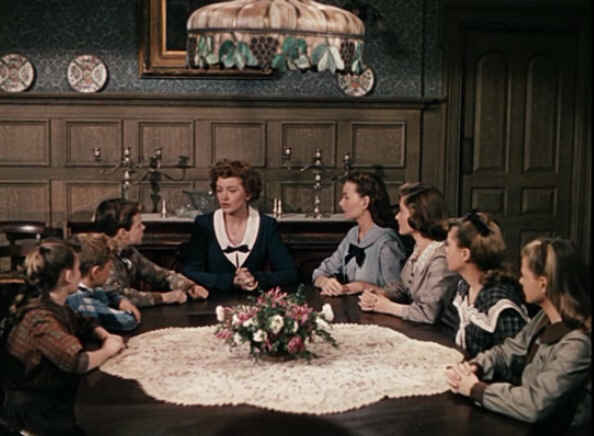 After the Gilbreth family moves in, the mother (Myrna Loy) says the house was “too big for two servants” to handle, so they had a family meeting to tell the children they’d have to start pitching in. Times were tough! After Frank dies of a heart attack, his wife and 12 children are left to fend on their own. One of the reasons I got this movie out to watch it again was because I had just re-watched the Steve Martin-Bonnie Hunt remake and wondered how much it had to do with the original. The biggest difference was in the way the children were portrayed. 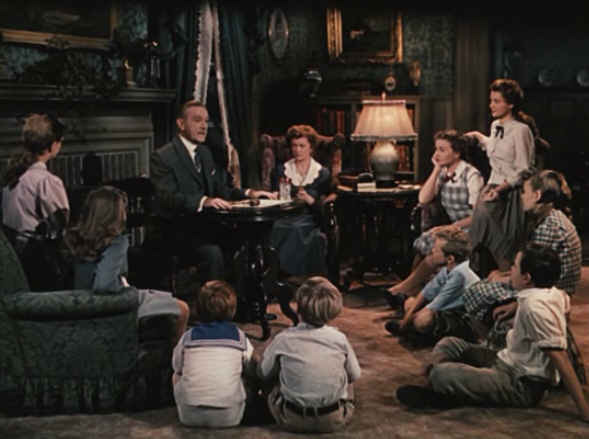 In the original movie, the children weren’t perfect, but they were well-mannered, respectful, and loving, even though their father is strict and demanding. *UPDATE: The gorgeous old house the family moves into in the 2003 remake is on the market! You can get the book the movie was based on here and get the DVD of the classic here (affiliate links). 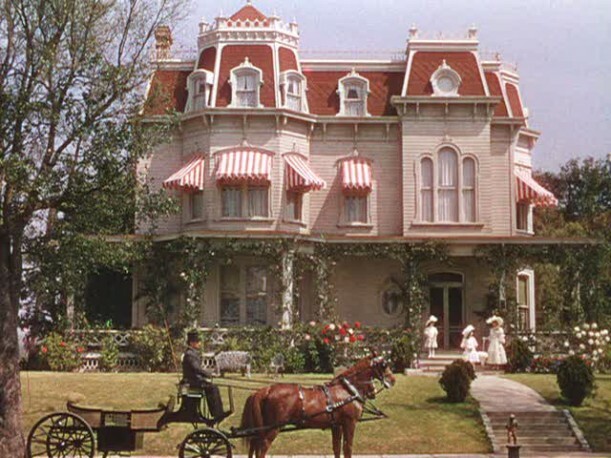 You can see more photos of the Second Empire Victorian in my post about Meet Me in St. Louis, and the list of all the other movie houses I’ve featured on my Houses Onscreen page! The Cornish Cottage in the Demi Moore Movie "Half Light"
The Houses in Steve Martin's "Cheaper by the Dozen"
The Steve Martin remake drives me crazy. I have six kids and I would say the biggest difference between a big family and a small one is that you can’t let bad behavior slide. There is no way I could make it to the end of the day if my kids fought so much and were so dreadful. I’ve got to be on their back about good behavior constantly. When I had fewer children it was a lot easier to ignore the bad stuff. 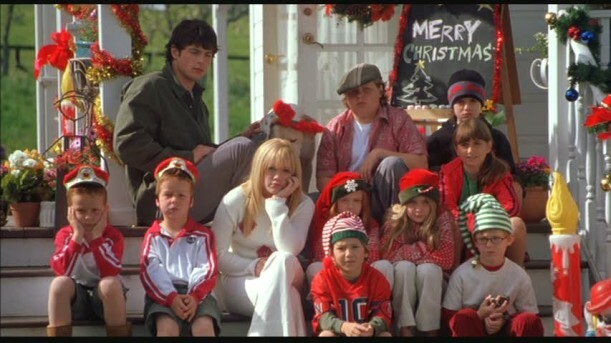 I remember thinking the same thing about the terrible dozen kids in this movie; that it was pretty unrealistic. If you know any mega-big families in real life, they usually have the most polite, well-behaved kids of all. You simply can’t have that many people in a house without there being some strict rules! Go rent it – it’s fantastic. There was a second movie called “Belles on their Toes” which is also great – same cast but takes place after they’ve lost the dad. Both “Cheaper By the Dozen” and “Belles on their Toes” are great books for the 10 year old crowd. Don’t miss! I felt the same way about the films, Julia! I much prefer the original. My 4th grade teacher read the book to my class, and I loved it so much that when my high school put on the play my Senior Year, I tried out for a part and played Anne (the oldest daughter). The original was still really funny without being gross or disrespectful. I’m not a prude by any means, but I don’t care for movies where the kids are ugly to each other and their parents. Anyways, the house. I actually do love both houses (original movie and the new one). I didn’t know the same one was used in Meet Me in St. Louis, but it makes perfect sense. Thanks for sharing the photos! Aren’t all of those houses beautiful. I read the book a couple years ago, and I find it funny to see that house looking so gorgeous on the interior of the photos above, because I remember reading their dad encouraged the kids to write ALL over the walls, or he wrote ALL over the walls and then he would repaint them and write ALL over them again. And in my memory the kids were hard on each other and the house. But sometimes my memory isn’t so good. It’s true. I’m interested to see the movie. I didn’t know it existed and I love a good old movie. I haven’t read the book since I was a kid myself and didn’t remember them writing on the walls. Interesting! They cut that part out of the movie version. It’s been a while since I read the book also, but I seem to recall that the wall-writing was in their summer house, and had to do with messages to make them learn Morse code. Now I’ll have to dig out the book! I think you are right – that was at their home in Nantucket or somewhere. Yes, that does sound familiar! I loved that book as a child! My kids wouldn’t read it, either. I remember the dad rules about bathing – they were given maybe 2 minutes and had to run the soap bar in a pattern over their bodies, I think, like start at the right side of the neck go down the top of the right arm, back up the underside of the arm, down the right torso, etc. Children were better behaved back then, and Hollywood seems to enjoy changing our standards of behavior. When my girls were younger (tweens, and early teens), we would turn off the television when their mouths got ‘sassy’ because I knew EXACTLY where they were learning that behavior! I have fond memories of reading this book. It wasn’t until much later that I saw both movies. I was in love with all the rooms in the new home of the Steve Martin remake, especially the turret bedroom – as rustic as it was. (It was the secret escape slide that clinched it). Reminds me of the Yours, Mine and Ours Henry Fonda/Lucille Ball movie too. I loved their large leaky old home they bought when their families blended together. I never heard that. Interesting! The other complaint I had about the remake was that Steve Martin was supposed to be a school football coach, yet he was helpless when it came to controlling… teenagers? Bad, bad writing. Nice houses, though! I beg all of you to watch the original of I Remember Mama. It is not only a classic about a family pulling together to face tough times but is also based on the story of an actual family. The film was made in the 1940s and is a gem, starring Irene as Mama. Our family can watch it over and over again. I totally agree – that movie is a gem. Yes like that show “what you can get for the money”. It features a certain price and shows houses all over the country for that price. For example a house in Texas with four bedrooms would sell for 200,000 but for that in New York , forget about it. You might get a tiny apartment with a roommate. In California you might be a 2 room condo for that. I loved the original and watched it many times. My favorite scene was when the father was interviewed (I think) and he showed how he taught his children to bath in one minute. He sat in their tub, fully clothed, and demonstrated from the top of his head, down one side & up the other. I always wondered how his daughters could wash their long hair under those restrictions. The swimsuits, the epidemics, all were so funny and amazing at the same time. Thanks for reviving the memories. BTW, I disliked the Steve Martin version that I never have seen the entire movie. Don’t know how it ends. Thank you for reminding me of this classic, I’ll have to go search Netflix for it! Oh my goodness! I love this blog. This made my day! I loved this book growing up and read it many times (and the follow-up “Belles on their Toes” which is also a great movie!). It’s a book and movie to cherish. Thanks for the pics – that house had some magic to work for both of those classic movies! The Steve Martin “version” was not a “version” (or re-make) at all. Except for having 12 children – there was no connection. The father’s occupation, the theories of child-rearing along with time-motion studies, the location – none of it resembled the book in any way. It’s a shame because a true re-make would make a great film. An even worse destruction is with “Yours, Mine and Ours” which was a movie with Lucille Ball and Henry Fonda based on a book called “Who Gets the Drumstick” (which I still own a yellowed copy of this book!). It was a silly romp (also with a great house!) but had some decent moments. The “remake” with Dennis Quaid was awful – the kids behaved like animals, the story was ridiculous (no relation to the book at all) and they left out all the beauty of the book. Love your blog and thanks for the treat today! 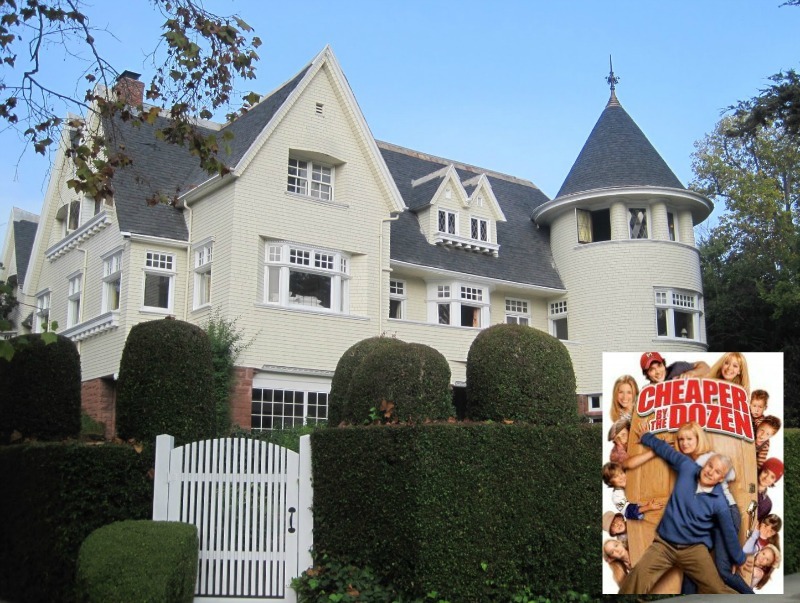 I love the original Cheaper by the Dozen house. There’s something about old classic homes that are so appealing. 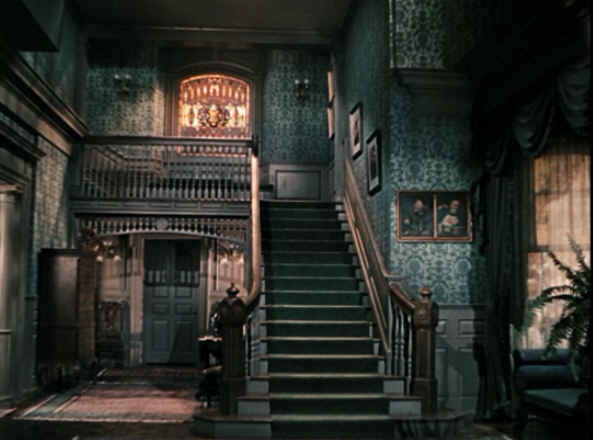 The only good thing about the remake to me was the Victorian home. I loved the staircase and that tower room was so cool. I would love a bedroom like that. I love both the original CBTD and MMISL and didn’t realize it was the same house until you mentioned it. Now I see it. My younger kids have loved the Steve Martin-Bonnie Hunt version but, I too, love the original so much more. I long for the days when kids respected their parents in real life AND in the movies. What’s neat about using the MMISL House in CBTD is that CBTD is Fox film from 1951 and the MMISL House was an MGM film. So the Fox film Company had to venture over to the MGM back lot to film these exteriors. 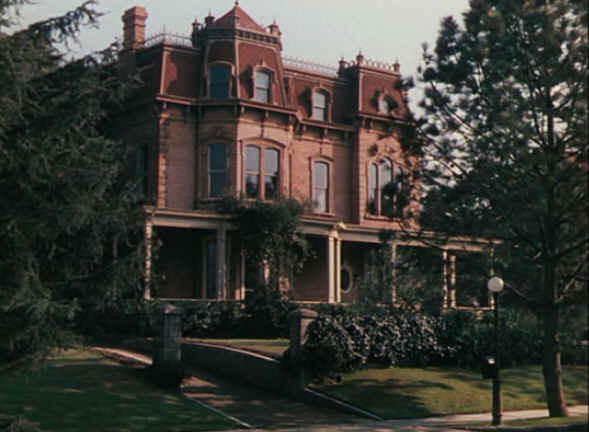 That same house was used in a bunch of other, mostly MGM films. Ever see the Long Long Trailer with Lucille Ball and Desi Arnaz? Remember the scene where they are backing the trailer into the driveway at her Aunt’s House and destroy the porte-cochere? That was also the MMISL House. And right across the street was the house used in the 1945 film “Valley of Decision” with Gregory Peck and Greer Garson. Fascinating information, Richard! 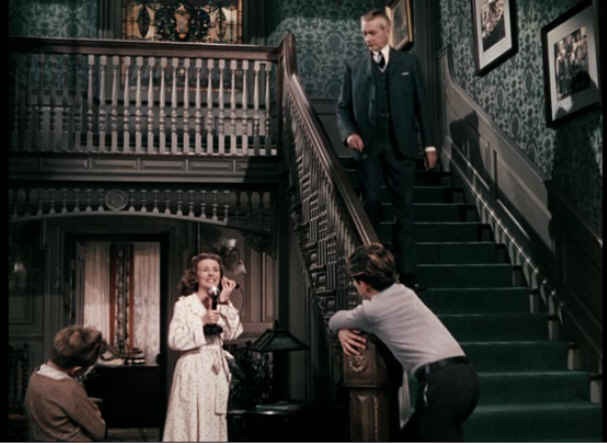 Do you know about any of the other homes used in older movies? There are so many gorgeous ones? 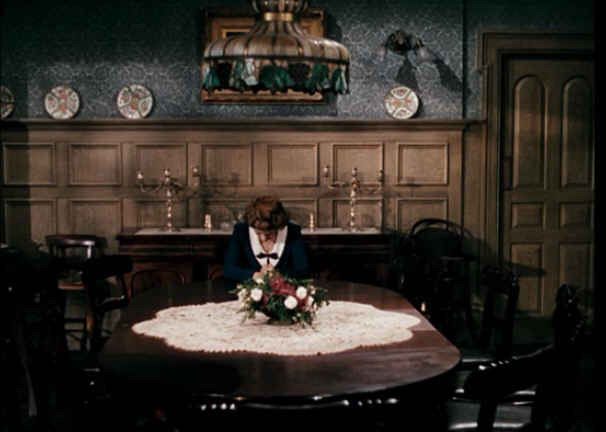 I believe that many of the “homes” used in Shirley Temple movies were actually Hollywood stage sets but I am so curious about those which may have been real, from The Littlest Rebel to Poor Little Rich Girl to Rebecca of Sunnybrook Farm and more. The studio even had a mini “home away from home for her, created from a real 10 room bungalow. Would love to see photos of that home! Then and now, assuming it still exists. I’ve never seen the original, but I really enjoyed the remake, especially the amazing house!! Why is it that houses with canvas awnings all over them in real life looks terrible but in the movies looks like DisneyWorld? Because in real life they get dirty and do (probably) look awful unless a regular awning cleaner is available and affordable. In DisneyWorld movieland they probably take them down or replace them regularly. Maybe even once a week. I love, love, love that house. It’s probably one of my favorite houses ever…even a character shaper for me. 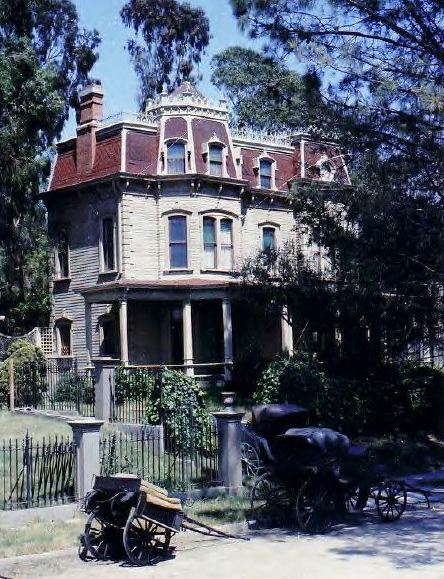 That and the Adams Family house. And probably the old rickety one from It’s a Wonderful Life. Yep, that’s what happened to me as a child. I love the one in It’s a Wonderful life because it had that loose canister top. We had one of those in our old home, no matter how often we fixed it. I chalk that up to 3 boisterous boys who were hard on our stairs. A little imperfection in a home makes it seem more lovable to me. Frank Gilbreth also wrote the book, “Time Out for Happiness” about his mother’s later life after her husband died and the children married. Very good! I didn’t know about that one–thanks, Marie! I loved the original and the sequel, two of my most favorite movies from my childhood! I loved the part when the oldest daughter was asked to the dance and the father insists on going along as her chaperone! I will have to look into getting them on DVD. Wow this house looks so ancient, nice and royal. Reminds me of the british era when all these big houses were there and were very common. You hardly ever get to see them now. Anyway, I tried to get my stepdaughter to read the books, but she won’t! I think I’ll have to go with reverse psychology. Or tell her they are a family of vampires….